To find where your recordings are stored, go to File > My Recordings. Both local recordings and automatically recorded broadcasts will be found here. You can rename your selected recording by clicking the pencil icon and delete selected recordings by clicking the trash icon. The Open Folder button opens your recordings folder in the File Explorer. 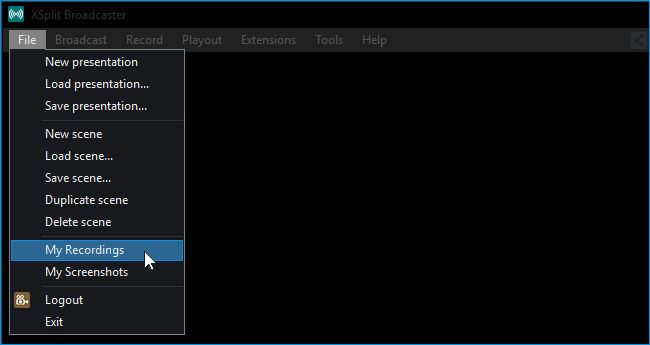 The Express Edit button opens the Express Video Editor with your selected video. Click on … on the Locations bar and choose a folder for where your recordings will be stored. Choose a recording that you want to upload, then click the YouTube icon at the bottom-right of the Recordings window. 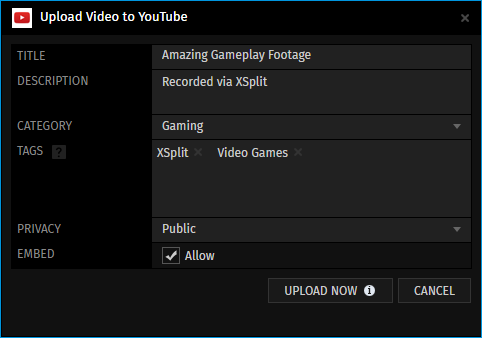 An Upload Video to YouTube dialog will be shown. Enter the details for your YouTube upload, then click UPLOAD NOW. Sets the title that will appear on your uploaded video. Sets the description that will appear on your uploaded video. Sets the category of your video upload for organization and target audience. Add tags to help users search for your uploaded video. Choose whether the livestream is publicly visible, unlisted or private. 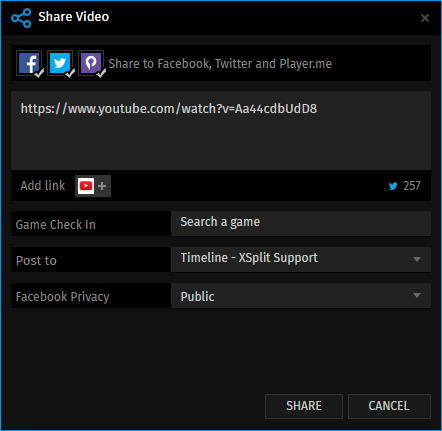 Allow an embed code for your video upload. Clicking any of the social media icons lets you share a YouTube uploaded recording on their respective social media platforms. Click to add the YouTube upload URL in the custom message field. Allows you to tag a game you are currently playing on a Player.me post. Allows you to choose if your post is visible to the public, your friends or only you.